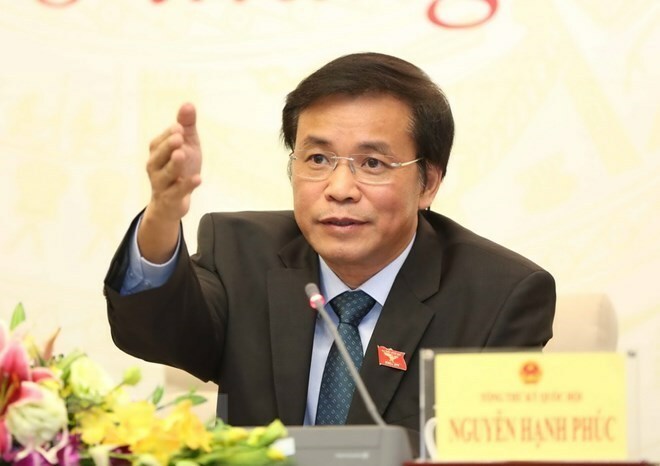 The National Assembly (NA) will elect the State President at the beginning of the sixth session, said NA General Secretary and Chairman of the NA Office Nguyen Hanh Phuc at the NA Standing Committee’s 28th meeting on October 16. The early voting aims to facilitate the submission of proposals and documents afterwards, he said when reporting to the Standing Committee preparations for the upcoming sixth meeting of the 14th legislature, slated to open on October 22. Phuc said the agenda for the meeting has been sent to lawmakers, adding that they essentially agree with the contents and have made several suggestions. Besides the election of the State President, the scheduled agenda includes ratification of the Comprehensive and Progressive Agreement for Trans-Pacific Partnership (CPTPP) and related documents, a resolution on extending the pilot issuance of e-visas for foreigners entering Vietnam, and vote of confidence on Government members. Opening on October 22 and closing on November 21, the NA’s 6th session will review the three-year implementation of the NA’s resolutions on the 2016-2020 socio-economic development plan, economic restructuring, national finance and mid-term public investment, along with socio-economic and the State budget performance for 2018. Legislators will discuss and decide on a socio-economic development plan, the State budget estimate and allocation for 2019, as well as adjustments to the mid-term public investment plan for 2016-2020 and the 2016-2020 financial plan. They are due to approve nine draft laws and two draft resolutions, including the amended Law on Corruption Prevention and Control, the revised Law on People’s Public Security, the amended Law on Amnesty, the law on amendments and supplements to several articles of the Law on Tertiary Education, the Law on Animal Husbandry, the Law on Cultivation, the Law on Vietnam Coast Guards, the Law on Protection of State Secrets, the law on amendments and supplements to laws regarding planning, the resolution on the approval of the CPTPP and related documents, and the resolution on extension of the pilot issuance of e-visas for foreigners entering Vietnam.